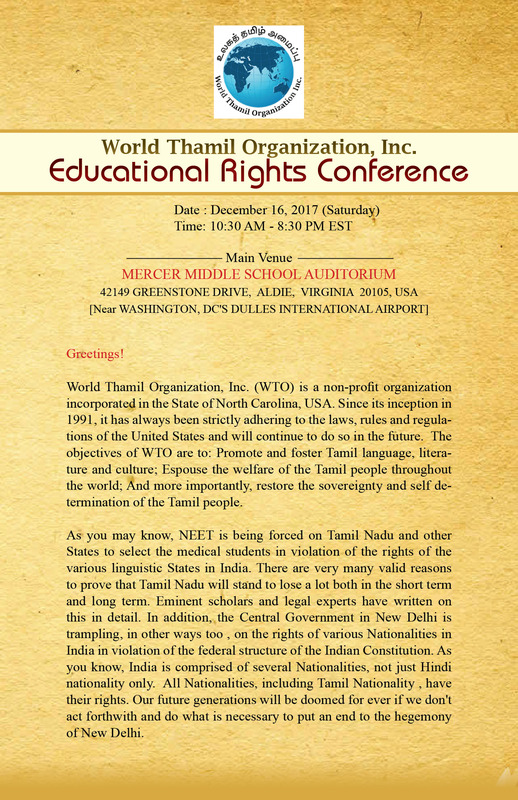 Organized by World Thamil Organization, Inc.
World Thamil Organization, Inc. (WTO) is a non-profit organization incorporated in the State of North Carolina, USA. Since its inception in 1991, it has always been strictly adhering to the laws, rules and regulations of the United States and will continue to do so in the future. The objectives of WTO are to: Promote and foster Tamil language, literature and culture; Espouse the welfare of the Tamil people throughout the world; And more importantly, restore the sovereignty and self determination of the Tamil people. As you may know, NEET is being forced on Tamil Nadu and other States to select the medical students in violation of the rights of the various linguistic States in India. There are very many valid reasons to prove that Tamil Nadu will stand to lose a lot both in the short term and long term. Eminent scholars and legal experts have written on this in detail. In addition, the Central Government in New Delhi is trampling, in other ways too , on the rights of various Nationalities in India in violation of the federal structure of the Indian Constitution. As you know, India is comprised of several Nationalities, not just Hindi nationality only. All Nationalities, including Tamil Nationality , have their rights. Our future generations will be doomed for ever if we don’t act forthwith and do what is necessary to put an end to the hegemony of New Delhi. Further efforts are underway to invite additional speakers. 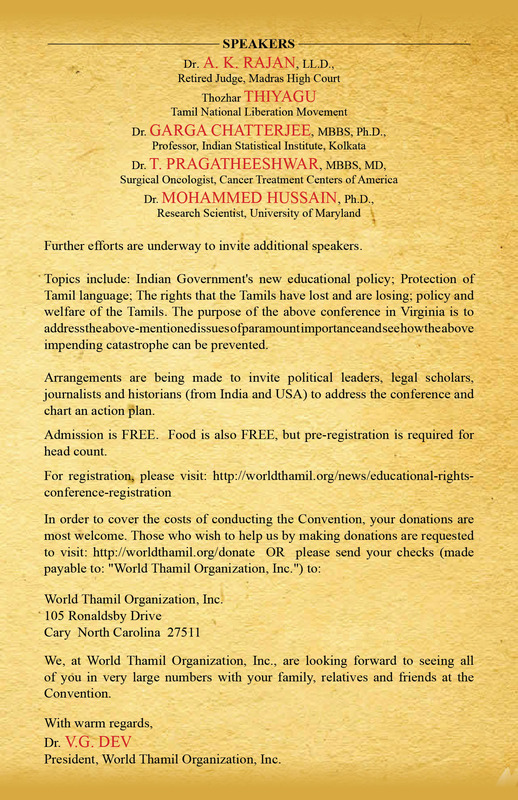 Topics include: Indian Government’s new educational policy; Protection of Tamil language; The rights that the Tamils have lost and are losing; policy and welfare of the Tamils. The purpose of the above conference in Virginia is to address the above-mentioned issues of paramount importance and see how the above impending catastrophe can be prevented. Arrangements are being made to invite political leaders, legal scholars, journalists and historians (from India and USA) to address the conference and chart an action plan. Admission is FREE. Food is also FREE, but pre-registration is required for head count. 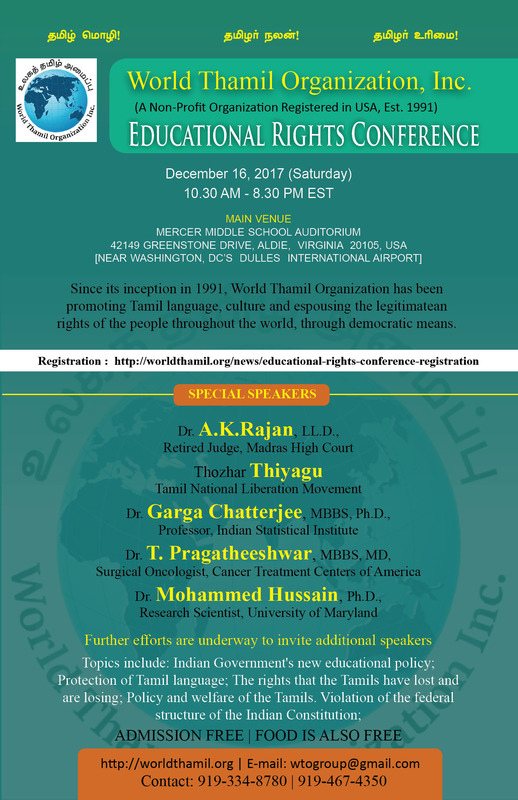 We, at World Thamil Organization, Inc., are looking forward to seeing all of you in very large numbers with your family, relatives and friends at the Convention. 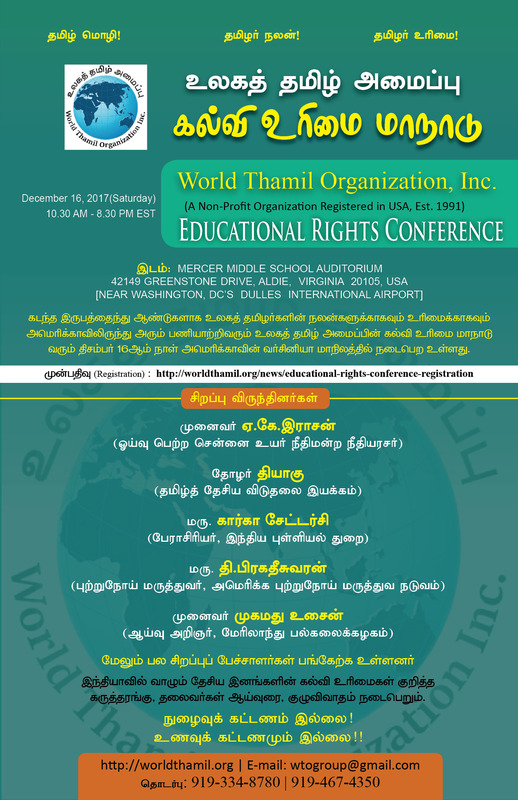 December 6, 2017 WTO Admin Current Affairs Comments Off on Educational Rights Conference ! ← மாவீரர் நாள் கூட்டம் !